For the past four months a display of Fentongollan's finest daffodils have been supporting the 2008 Bulb Mania festival at the Eden Project. Visitors to the attraction have had the chance to admire some 35 different varieties grown on the farm which have included some new and unusual varieties. Passers by were full of questions about planning and planting their own daffodil displays and were keen to find out more about the daffodil industry in the region. 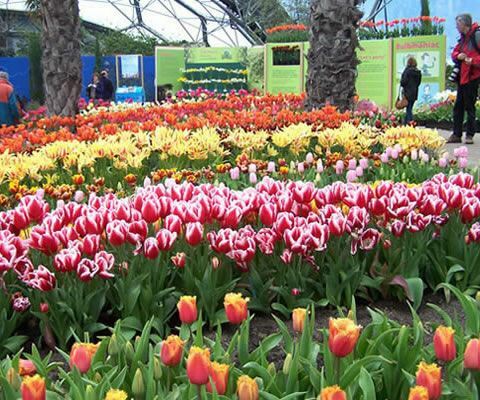 Jim Hosking who headed up and maintained the display said "it has been particularly good this season, the cool weather has kept the daffodils fresh and they have lasted right up and through the tulip season, a great compliment to Eden's magnificent display". A extensive collection of Fentongollan's daffodil bulbs will be available to purchase from the Eden shop from September onwards and Fentogollan hopes to be back at Bulb Mania again next year with an even bigger and better display.